Being low cost and having a good product are important if you want to be a successful company, but they aren't the only things. Wouxun should want their re-sellers being evangelists for their products. "The strongest point of the Wouxun KG-UV920P is the quality of the receiver. On the frequencies that matter this receiver does what it’s supposed to do. And it better be good – we lost all those RX bands we originally drooled over." "Wouxun finally competes with the big three." Hans got the new sample and his first tests for the version P (KG-UV920P) has got him excited - no problems with second or third harmonics on 2M or 440 and the rotary encoder problems are gone. It is such a shame that these things start out so bad. I think the marketing teams get too far a head of engineering and manufacturing. I noticed that Dale sold out of the radios in three hours this week. I saw this morning that Ed has more of the rigs for sale and then I saw the review from Hans. Please go to his site to read the entire review. - Updated Microphone -- Added a built-in speaker in mic's front & a switch to defeat the Channel Up/Down button (which was easy to accidently hit). This switch was also supposed to lock all buttons on the mic, but not sure about that yet. - Bracket for mounting detachable control head. - Updated Firmware -- Several menu functions have been added. See the owner's manual for all functions. "If I may be blunt: many flaws are impossible to live with. If I transmit, I want to be heard. If I listen, I don’t want to be annoyed by noise, distortion and high pitched tones." 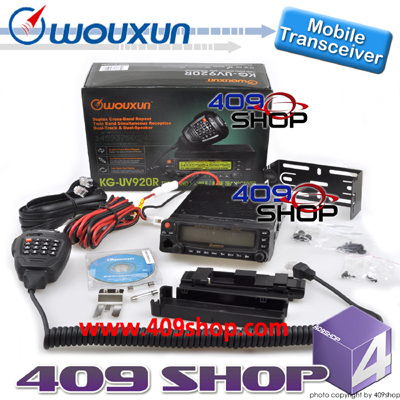 "If I would like to own a Chinese mobile radio, I’d rather put my money in an improved version of the Wouxun KG-UV920R." I think this reminds us, as it certainly is not news, that the Chinese process for design and manufacturing is to roll out models as quickly as possible, let the early adopters identify problems, and then fix the problems in subsequent releases. "The KG-UV920R isn’t a bad radio, but for €299.00 I expect it to be as good as the competition. That’s not the case – yet. If the described problems are solved, I wouldn’t hesitate to buy one." Check out his review for his reasoning. Sounds like a couple of fixes and a price reduction and it could still be the radio we were all hoping for. The KG-UV920R is now in the FCC database. Wouxun reviews the Wouxun KG-UV920R... and no surprise, they like it! Conference in Shanghai in 2010, showing the great interests in this transceiver. size is 140*44*27mm and the volume is almost the same as FT-8800R/TM-V71A. necessary to incline the radio body. separated radio body and the long extension cable as the standard accessories. user manual about making a professional connection cable for this transceiver. it is used in a hot workplace and high-load work. An intimate idea. benefits during the multi-vehicle radios and the remote separated installation. front panel, the PC connector by side and the double external speaker jack. two mobile radios for the offset repeating on the same band. knob, but it is a little small because of the little space. LED indicator. The hand mic can be regarded as a remote controlled KG-UV920R. 999 channels.Nowadays the memory spaces for the transceivers are very large. Menu 3. Mid power is divided into two levels(10W and 20W). to directly input the menu number to get the expected function. KG-UV920R is also able to adjust the frequencies/channels by switching the knob. necessary to connect two transceivers as a repeater. listen to the broadcast programs in the spare time. under the higher SWR value. tested transceiver is 136-174MHz & 400-480MHz, which is really large range. From the above testing result, the KG-UV920R gets the expected power. the most concerned by the HAMS. the transmitting, it will come out a voice prompt. against the domestic and abroad transceivers, and very considerable in details. HAMs the cheaper but higher performance radio equipment in future. There is a Yahoo Group for the Wouxun KG-UV920R... 195 members and only 165 messages since it was created in late 2010. I'll join and see if it has anything to offer beyond what we see in the original Wouxun KG-UVD1P (etc.) group. Lots of good stuff here... all these posts give me the impression that this radio is no different than lots of the other Chinese radios in that there is a price for being first. Hopefully, they will correct the problems in short order. "Lack of proper cross-band repeat is a killer for me. I’ve tried all their modes and none of them let me use a repeater on one vfo and simplex on another. It just simply does simplex-simplex repeating. So if you need a simplex cross-band repeater then your in luck." "So I contacted Wouxun yesterday and asked them specifically what steps I needed to take to enable the XBand repeat. Here is what I got from them. So after trying this multiple times, doing a complete wipe of the radio and starting over I can’t seem to get it to work. Anyone else?" "[Wouxun] have confirmed that the flat cable included with the radio does not provide adequate shielding ( which we already knew ). They have replaced it with a standard CAT5 cable and RJ45 connectors. I have done the same and noticed quite a reduction in the DC noise in the audio when my truck is running. My next step will be to add a clip on choke and see if that gets rid of it altogether." "I was on my local repeater last night and had a simplex channel that I use with a few friends in the area. Anyway… I noticed that when I have a conversation going on on one VFO the second doesn’t rx anything. They were both VHF." Adding VA3ISP to my RSS feed now! YAWKG-UV920R* gripe session on the Wouxun Yahoo Group included a link to this radio on eBay. This radio being the HYS TC-UV55 that has been written about here and here. "I can speak to this subject. I have a prototype of that radio that I was considering carrying it as a mobile alternative with the Wouxun HT. It is NOT certified and the company wasn't interested in spending the money to certify it. I guess it runs about $5000 according to them. I don't know. I still have the new unit in a box. It replicates the Kenwood TM471 radio. I even did a price survey for them and they asked me for a recommendation on the button layout for the front of the radio. My price answer was between $199 and $250. Perhaps they settled on $239 - not sure. I stopped negotiations when he said he was best friends with the owner of Wouxun. I didn't want Wouxun to think I was going behind their backs while I am their dealer. It's unfortunate this is not legal in the U.S. It is a great radio as far as I can tell without resulting in my prototype becoming a "used" radio." The auction ended with a winning bid of $306. Not much of a deal since Ed sold his 10 for $325 (including a free KG-UV2D HT). I can only assume that scarcity is keeping the price high at this point. Someone is selling their unused (new except for opening the box) KG-UV920R. There are four bids at the moment with the current bid of $102.50 - reserve not met. It will be interesting to see where this goes. Thanks again to Steve! He sent me the link to the 409Shop listing for the KG-UV920R. 409Shop is selling it for $375. Steve pointed out that the KG-UV920R is available on eBay for a mere $389.80. The listing says more than 10 available. You can add a warranty for $53.99.